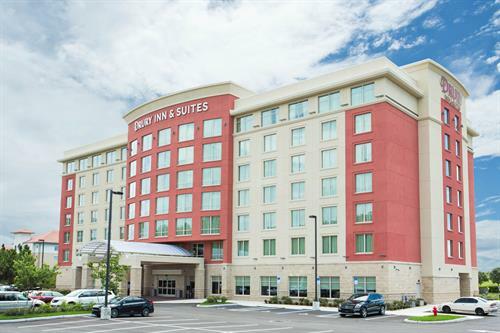 The Drury Inn & Suites Gainesville is perfectly situated at I-75 and SW Archer Road, just minutes from Gainsville attractions. This Gainesville hotel near UF is also within close proximity to Gainesville Regional Airport, Butterfly Rainforest, Florida Museum of Natural History, Paynes Prairie, Ben Hill Griffin Stadium (home of the Florida Gators) and Kanapaha Botanical Gardens. Gainesville hotel guests can take advantage of 30+ miles of outdoor trails for hiking and biking in seven area state parks. Drury Inn & Suites Gainesville guests enjoy free breakfast, free 5:30 Kickback®, free Wi-Fi throughout the hotel and more! At Drury Hotels, The Extras Aren’t Extra®.